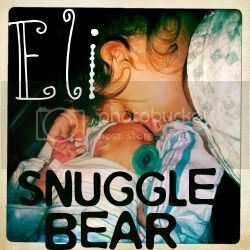 Snuggle Bear Eli: Sweet Baby. The way your belly folds over the top of your diaper, and your adorable double chin. I can't seem to get enough of you chubby boy. I love the sound of the pitter patter of your little hands patting against floor. I love when you glance over at me and decide you much rather crawl to mommy then play with your toys. I love everything about you and everyday you just keep getting more love-able.